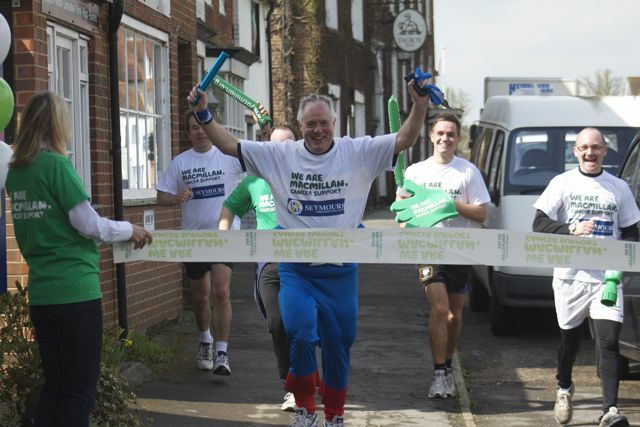 West Surrey’s independent estate agent, Seymours, has raised over £15,000 for Macmillan Cancer Support following a series of fundraising events throughout 2013. Seymours’ largest community undertaking took place earlier this year when it created and launched The Seymours Relay – a relay covering all of its 12 offices across 63 miles. All directors took part, either running or cycling their ‘legs’ of the race (ranging from 1.7 - 11 miles long) before passing the baton onto the next office. The relay took eight hours to complete and raised over £3,500 for charity. Seymours regular Pimms tents, as well as hosting The World’s Biggest Coffee Morning throughout its office network, has taken the total so far to over £15,000 and represents the largest amount of money raised for charity by the estate agent to date.